The new State Government’s freight infrastructure plans would tie in neatly with a proposal to develop fast passenger train services to connect Adelaide with nearby growth regions, writes Richard Blandy. Imagine being able to travel from Adelaide Railway Station to Strathalbyn in half an hour. I have been associated with a group proposing a fast passenger rail to service people and businesses in the Fleurieu region as well as in the area through Monarto to Murray Bridge. The proposal has been developed by a Canberra-based engineer, Edwin Michell, who comes from Adelaide, working with a number of people. This group is chaired by another well-known Adelaidean, former deputy rail commissioner Luigi Rossi, and includes two well-known Adelaide business identities, Ian Webber and Nick Begakis. The fast passenger rail proposal dovetails neatly with the Northern Freight Bypass proposal of the recently-elected State Liberal Government because it is a prerequisite of the passenger rail proposal that freight be removed from the southern rail network from Mount Barker to Adelaide. The proposed fast passenger rail network, shown on the network map, below would transform travel times to and from a number of regions. Travel times to and from Adelaide Railway Station on the Hills and Encounter lines are expected to be: Mount Barker 22 minutes, Strathalbyn 33 minutes, Goolwa 47 minutes, and Victor Harbor 61 minutes. Monarto would be 33 minutes from North Terrace and Murray Bridge 40 minutes (on the Murray line). The proposed passenger train has a maximum speed of 160 km/h, because this is the speed at which level crossings are still permitted, enabling considerable savings (for the same reason, the maximum passenger train speed in Victoria is also 160km/h). The benefits of the proposed service would be a boost to the population and economy of the southern Fleurieu region, as well as a reduction in the rate of outward movement of the greater Adelaide urban boundary. The population of the region – which includes the LGAs of Alexandrina, Victor Harbor and Yankalilla – was estimated by the Australian Bureau of Statistics in 2017 as 47,628 people. This number could easily double in the first decade after the southern passenger rail is established. Greater Adelaide’s population is increasing by about 11,000 a year. If half of this increase were to settle in the Fleurieu region instead of greater Adelaide – drawn by the easier commute and economic opportunities brought about by the rail project – in 10 years’ time the population of the region would exceed 100,000. Such an increase would more than double the gross product of the Fleurieu region from about $1.8 billion to just under $4 billion, because the extra commuters and people working locally would, on average, earn, and spend locally, more than the present residents, many of whom are retired. This would raise the Fleurieu region’s share of South Australia’s gross product from about 1.8 per cent to just under 3.5 per cent. How does one arrive at these numbers? Alexandrina’s gross regional product has been estimated at various times over the past 10 years by idcommunity (a Melbourne-based consultancy, using work by the National Institute of Economic and Industry Research) as, fairly constantly, about 1 per cent of South Australia’s gross state product. This translates to a gross regional product for Alexandrina of $0.98 billion in 2012, increasing to a GRP of $1.02 billion in 2017. This is a rate of increase of 6.3 per cent over five years. The ABSs estimates Alexandrina’s population as being 24,055 in 2012 and 26,775 in 2017. Dividing the GRP figures by the population figures yields a GRP/head of population for Alexandrina of $39,909 in 2012 and $38,095 in 2017. By comparison, GSP/head for South Australia as a whole was $58,281 in 2012 and $59,393 in 2017. The lower GRP/head figures for Alexandrina are essentially due to the large percentage of retired people in Alexandrina’s population. 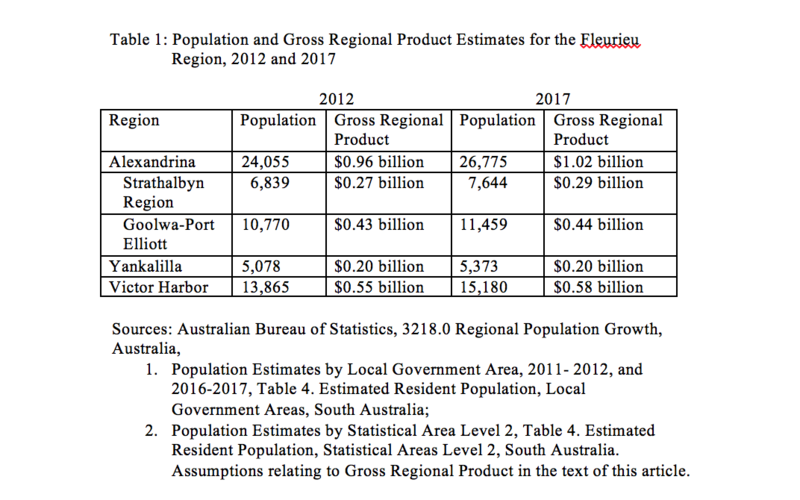 Assuming that every area in the Fleurieu region for which we have population data also had Alexandrina’s GRP/head (which is not a very good assumption, but the best we can make in the circumstances), we can estimate the following economic output figures for every area in the Fleurieu. The Strathalbyn region appears to be the fastest-growing regional economy (an increase of 7.4 per cent in its Gross Regional Product over the five-year period), followed by Victor Harbor (+5.5 per cent), Goolwa-Port Elliott (+2.3 per cent) and Yankalilla (+0.0 per cent). Yankalilla is not proposed to be serviced directly by the southern passenger rail. Hence, Yankalilla’s population and economic growth will not be impacted much, although there is likely to be some spin-off from the accelerated growth of Yankalilla’s regional neighbours. While all locations abutting stops on the proposed railway will benefit from it, the region that may well benefit most from is around Strathalbyn. Strathalbyn will be only 33 minutes from Adelaide Railway Station, which makes it a comfortable commute to the city. There is attractive land for expansion around Strathalbyn. It has plentiful access to water, is the heart of an expanding wine district, and it 40 minutes by car to the towns of the Encounter Coast. Richard Blandy is an Emeritus Professor of Economics at Flinders University and was an Adjunct Professor of Economics at UniSA until the beginning of 2018.